New Century Careers has teamed up with the Pittsburgh Chapter of the National Tooling and Machining Association (NTMA) to provide our region’s manufacturers and individuals with a proven metalworking apprenticeship related instruction program. The Apprenticeship Program is designed to provide related instruction classes to support on-the-job training provided by employers. Classroom training is offered at convenient locations in both Allegheny and Westmoreland counties. While the instruction is open to anyone who would like to register for this four year program, apprentices who would like to earn their journeyman’s papers must also be registered with his or her employer’s qualified Pennsylvania apprenticeship program for on-the-job training. As a result of the NTMA Apprenticeship Program, both parties benefit in the form of wage increases for individuals and a highly skilled workforce for manufacturers. Learn more about the Apprenticeship Program from the links below. 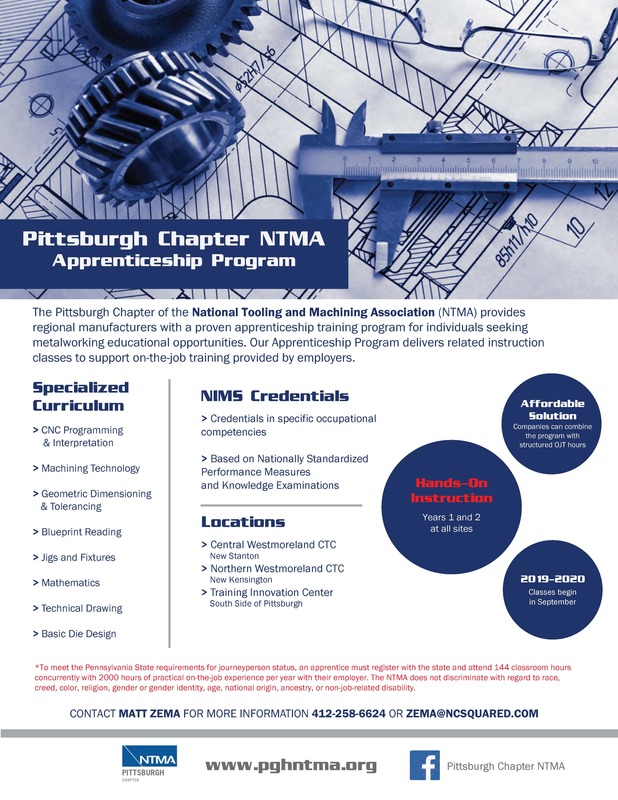 2019-2020 Pittsburgh Chapter NTMA Apprenticeship Classes Begin in September. For more information, check out the Pittsburgh NTMA Chapter’s website or contact Matt Zema at 412.258.6624 or zema@ncsquared.com.